A lot of these applications can be useful for your clients and even for yourself to help monitor the progress of clients. There are many benefits to using technology when it comes to helping your clients reach outcomes faster. This is due to a variety of factors. Portability – With the phone, so close by, wherever you may be, the chances of completion are almost doubled thanks to the portable nature of smartphones. Interactive – Apps allow for an interactive and often playful experience with homework. Real-time – A huge benefit for therapists is that a lot of the tools tend to have the ability to export or real-time update data allowing you to see the information you need ASAP. There are so many great ways you can take advantage applications, but making sure to combine them with other homework types will help to give your client the best and all-round experience. One of the critical areas that we’ve explored is the homework compliance side of things, so if you feel you are struggling with this area, there’s plenty of useful articles on our blog to help guide you into compliance (like this one and this one). Remember to know your clients and personalize the introduction of apps to each of the clients you work with and their habits. With a range of topics and homework to set for therapists using homework apps, what’s a good starting point?! Let’s dive into a few mindfulness & journaling apps that you can use for your clients to take full advantage of. Assigning mindfulness is a great way for your client to get comfortable with themselves and take full advantage of the personal nature of the applications for homework. Try assigning some of these mindfulness applications for mediation and remember to give your clients clear instructions to what sessions to start and join in on. Calm – One of the leading meditation applications, this is a perfect homework app for those looking to get started with meditation. Meditation can sometimes be stressful, with Calm, the balance between guided and non-guided sessions is solid. One of the latest features will help you assign even more specific sleep homework, using the sessions they allow users to practice before bed. Smiling Mind – With another similar experience to Calm, with Smiling Mind, you can go even more in-depth with the data you’ve been able to amass. As a client, using the application is very easy, and one of the best things about using this tool is it has a web application allowing clients to access this at work, giving them peace of mind in all aspects of their day. Headspace– A little more restricted, Headspace will take your clients down a path with their meditation using programs and courses to help them take control of their stress and anxiety. As one of the essential resources, many therapists have recommended it thanks to the fixed process and journey this takes clients through. Many people are turning to journaling as a way to capture their thoughts and emotions as they go across their day. Journaling apps have been in demand as for recent due to the benefits they ooze when simply writing a short entry every single day. For your client, this might be a great way to get started with journaling. Day One – One of the most popular of the resources, Day One provides an experience allowing you to capture all of your day, into a timeline. Easy to use and the ability to add images helps a client to capture their day, making it a really elegant homework app for capturing all of those moments. Therachat – Therachat comes with an open journaling option that analyses what clients write to help them spot patterns. 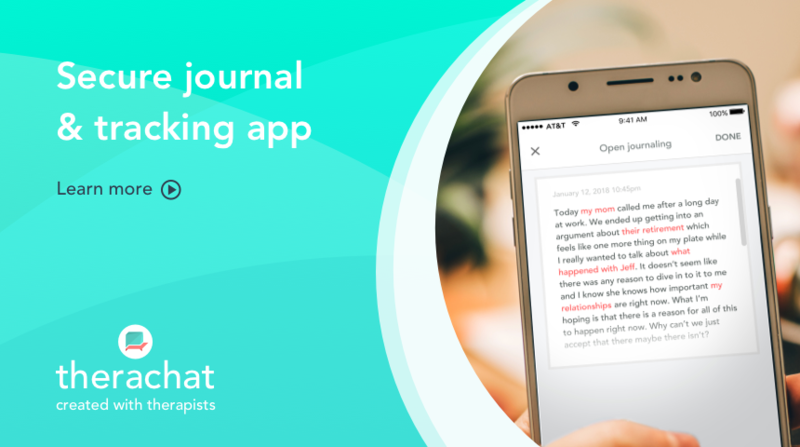 It shares the data easily with the therapist and allows therapists to use pre-made journal prompts, but also offers full customization of journal prompts. In realtime therapists can read what is happening in their clients lives, providing complete transparancy in between sessions. Momento – Speaking of moment, Momento is another, very similar to Day One providing users with the ability to capture all of their memories. The one thing that stands out on Momento is the ability to see all of your statistics, great for therapists looking to see which days were completed for their clients, without going into the personal details of the entries. Google Photos – Maybe it’s as simple as snapping as few photos. For your client, the benefits of taking photos might help them to embrace some of the homework. One of your assignments might be to take photos of important parts of your day to help be grateful for those moments, using the Google Photos app they can store all of these memories and help share them with the client to prove they’ve completed the homework set for them. So maybe your client is expressing anxiety and stress during sessions and as homework, you’d like to recommend they try some calming resources that helps them to de-stress and note down their experiences as they go across their day. Asana Rebel– Yoga is one of the oldest methods of reducing stress and anxiety, and it might just be suitable for your client. Of course, speak with your client onto whether they’d be open to trying yoga, if they’re happy, Asana Rebel is a great shout! Using their 5-minute workouts, it’s a definite starting point for their health and anxiety. MoodNotes – Granted there are plenty of ways you can track your emotion across your day, but this application provides a beneficial way to capture an emotion and feeling along with this. As a therapist, assigning emotion based homework might be a struggle for the client, but allowing them to capture in such a natural fashion will become suitable for their everyday routine in no time. Getting organized is sometimes one of the clients biggest worries as they get to take onboard therapy. After sessions, getting in control of their to-do list and notes will help them to make the front seat in their organization and support all of the anxiety and pressure be lifted just a little. When assigning homework, do consider organization as a factor that you can give as homework for your client to complete. Apple Reminders– A dead simple application designed for iOS users will give back a lot of control to your client. Ask your client to start tallying all of the tasks in their head using Apple Reminders, they might have their next week ahead planned within no time, but it’s a great homework item and definitely improve the chances of them completing their homework assigned to them outside of this. Google Keep – Android’s alternative, Google Keep provides a comprehensive way to write to-dos, add reminders and create notes across the day. It’s like having a post-it note stack in your pocket. Asking your client to start using this as part of their homework compliance can really help them take control and responsibility for their own organisation, especially the digital world we live in today. Todoist – Once they’ve made it through the Apple Reminders stage, they might need a resource a little more expansive than just the basic ones. Ask them to try the free version of Todoist, having access to such a powerful resource might allow them to get a full understanding of the power of their organisation abilities. Organizing, assigning and following-up homework itself can be very tricky. For therapists, with all the clients you manage and juggle, understanding what a client is working on can be stressful. Therachat aims to solve that problem by providing a comprehensive, mobile, HIPAA-compliant homework platform. Therachat includes a host of features, including; scheduling homework activities for clients, instant feedback and resources, and so much more, which all help your therapy sessions being more efficient, augment therapy sessions of clients and will help your practice thrive. Let us know in the comments what homework applications have worked for you and your clients as you take on homework compliance.